The only thing I have to fear? Vintage fabric. It’s a daunting task I have in store for myself. A few years ago, I decided to try my hand at quilting. I found it quite addictive. In fact, my grandmother, who was a spry 90 years old at the time, would sit and giggle with me over the secret we shared: I was making a monstrous purple quilt for my mom (her youngest daughter) for Christmas, and Mom had not a clue. One afternoon, I sat on the floor of her bedroom hand-stitching edges when she dropped this on me: her own grandmother, Eliza, had died before finishing a quilt she was making for her. It was in her hope chest. Had been there for years. And she wanted me to finish it. That was probably 9 years ago. Grandmother has been gone for some time, but I feel like I owe it to her to finish it. So a few weeks ago, I pulled it out of the chest where she had it stored for so many years, and I stared at it, realizing what all I had to do. First of all, the material is ancient. It’s literally 100 years old. The thought of using my Singer to tear into it puts a knot in my stomach. Secondly, I don’t believe all of the pieces are there. Which means I’m going to have to find modern-day material that somewhat resembles what my great-great-grandmother was using. Third, she stitched it all by hand. I have not the patience to take on that kind of feat, and for some reason, that makes me feel like I’m cheating. Do you see what I’m getting myself into?!?! Regardless, after winning Judi Ketteler’s Amy Butler giveaway, I’ve been inspired to pull out my machine and start on something new. So far, I’ve only made a pouch for The Owl’s new pipe. But I’m officially planning to take on the Amy Butler Daisy Chain Strippy Quilt to help get me in the mood to start the panic-inducing task of Grandmother’s Double Wedding Ring. And in between all of these, I’m still chugging away at Aidan’s scarf, some arm warmers for The Owl, and lots of little goodies for my bestie’s Bambino, who I look forward to welcoming into the world next Spring. Wish me luck, please. And send good vibes my way so I don’t puke all over Grandmother’s vintage goods. Suggestion from somebody who’s tried this? If the fabric is fragile…don’t try. Or I’ve seen quilters anchor it underneath to a strong, lightweight net fabric. 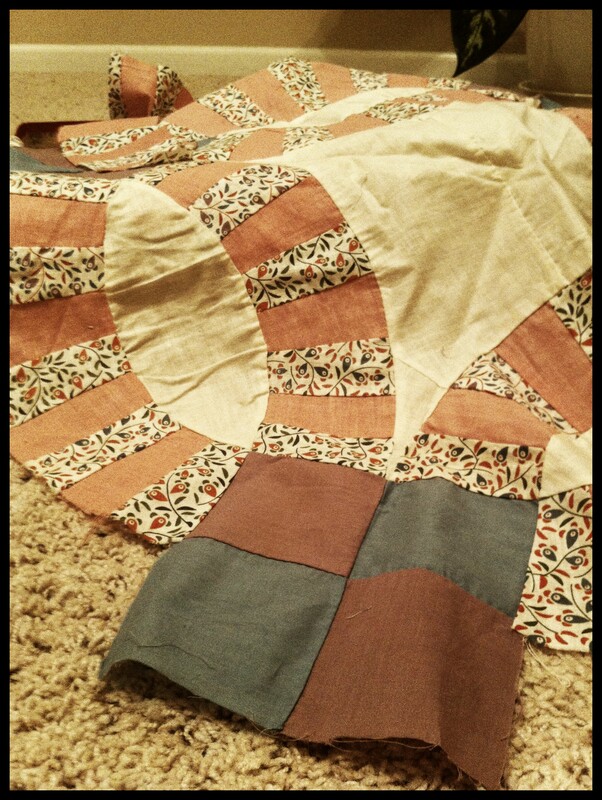 Or (also) use it as the quilt’s centerpiece, surrounding it with modern fabric. The problem with modern fabric (or, should I say, one of the problems) is that it holds dyes differently than old fabric does. They size-out and color-out differently in the wash. Which brings up another set of issues. Washing. Unless you plan to have the thing mounted under glass and protected, you’re in for a whole lotta hurt. Don’t want to be discouraging, but I’ve tried to save a lot of pound-puppy quilts. Without much success (or the immense amount of patience it requires.) Maybe (and I hope) you’ll have better success.